I fell in love with the bridge by my hotel in Rome. The first time I walked to it, it actually didn’t impress me. The water was dirtier than I expected and there was a lot of graffiti on the sides of the river bank. I walked back and forth over the bridge several times before its appeal was truly revealed. The entire time I was in Rome it was cloudy. Finally, on the last day the sun came out. I was crossing that bridge for what would be the last time and I decided to stop about halfway across and take in the view. Rows of trees lined the river. Their golden brown leaves shined in the sun’s last bit of rays. All along the sides of the river, there were little boats in every color. The sun was beginning to set over the trees and instantly everything became peaceful. This was a very busy part of town and cars were zooming by everywhere. But in this moment, everything became quiet. It was the most serene setting. There was even a photographer who stopped next to me to set up a camera on a tripod to take a photo. 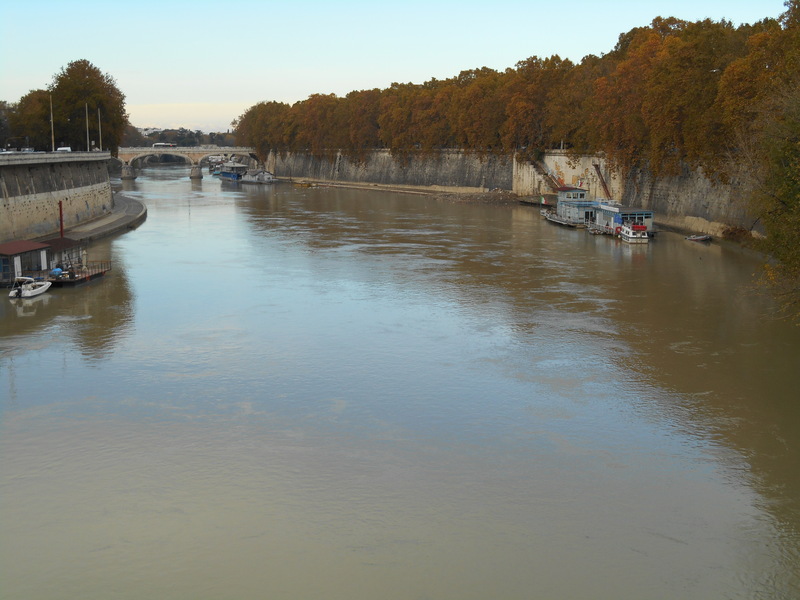 It was the perfect way to end my time in Rome, standing on a bridge over a golden brown river with the sun shining through the trees.